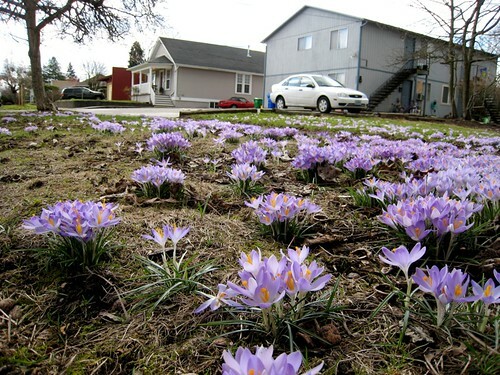 It's crocus-gone-wild. And thus I know it's springtime. 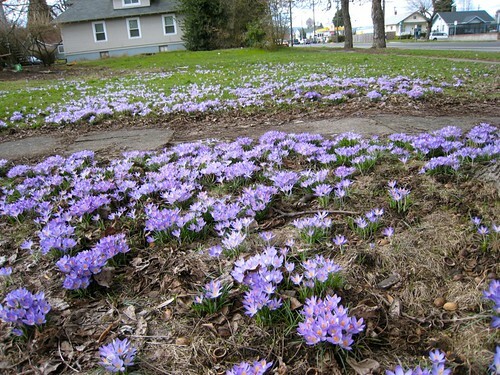 When this vacant lot in North Portland sprouts a sea of purple, the feral crocus are in full bloom. Some have jumped the lot and shown up across the street. I can only wonder how many years they've lived here. 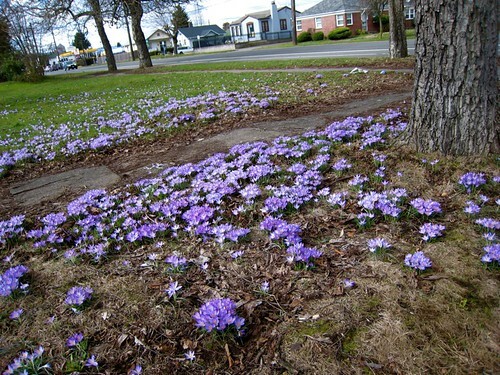 Spring forward, feral crocus, and thanks for the welcome wave to spring. I feel a little lost in writing about vulnerability, and feeling it's a topic covered so well by so many other people last year, and the year before. Technically, I have read all of these wonderful stories, articles and blog posts about vulnerability, and felt moved by them. I've watched Brene Brown's TED talk and known I'm watching something very powerful. I've read her book. But I hadn't been able to tap into the HOW of it all. That often seems to be the case with so many things, doesn't it? Wrapping our brains around the concept, yet frozen in how to apply it ourselves. To ourselves. I've talked about vulnerability with friends, I've written about it personally, I've used it as a daily intention: Allow yourself to be vulnerable. Yet it has fallen empty. Until recently. Having major surgery has forced me to rely on others, to ask for help, and to encourage my partner to ask for help. The two of us have had a mindset that has often included the words "We're strong women, we can do this!" and we have. Being vulnerable, to me, has been admitting defeat. Never admit defeat! right? But when you have no choice, like having surgery, it has meant give in and ask. As I've been healing and getting better, and from all external looks of it I probably look just fine to others, I've been forced to sit on my hands. To ask AdRi to take the laundry downstairs. To pick up X or carry Y for me. The natural "do-er" and "maker" in me wants to just do it myself. But I can't, and if I have, it actually makes AdRi frustrated with me. I wrote in my last blog post about seeing the garden open up to spring, and knowing how much needed to be done yet unable to do the work. That was an act of vulnerability. And with that act, several voices popped up and came forward. 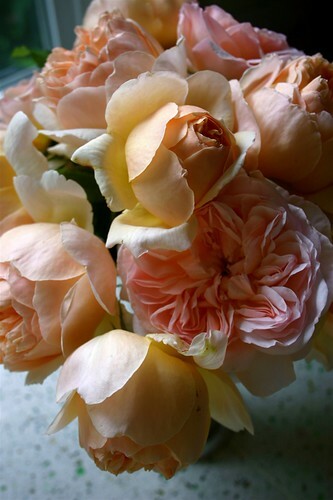 This weekend, I sat on a bench in the garden, directing friends in how to prune roses. And prune they did. We started with a simple young rose, and ended with the massive burly overgrown climber. They used loppers, handsaws and pruners, and stacked all of the cuttings in the back of the truck. It was amazing. And fun, and sweet. They learned how to prune roses, and I could let my fretting about all of the work that needed to be done, fall by the wayside. By showing an inkling of my vulnerability, buried really, in a blog post and hidden by references to spring and Beyonce's baby, this vulnerability sparked the desire of others to help and I allowed the help in. This being vulnerable thing is something new to me, but I know there are things in there for me to learn. It's an area to continue to scratch in, and see if I can allow more of it in my life. For now, I'm so thankful, and I'm pretty sure my roses have never been pruned as thoughtfully or with as much care as they were this weekend. Thank you Lacy and Gretchen. Until they bloom this spring and summer, here's a photo of a bouquet from Jude the Obscure, that huge gnarly rose in the front of the garden you did a hard prune on this weekend.